Unmanned aerial vehicles (UAVs) have come a long way in recent years. Lightweight parts and sophisticated sensors are now the norm, and cutting-edge technologies once reserved for industrial and military applications are available to consumers at relatively low costs. At Switzer, we strive to fuel UAV growth and innovation by manufacturing and implementing high-precision metal parts. Here are just a few of the UAV design evolutions we’re enthusiastically exploring with our customers. In the battle against gravity, lighter is better. Extra weight will invariably limit speed, range, battery life and duration of flight. Higher altitudes also require greater resistance to gravity, and heavier drones can’t reach the highest heights. Fortunately, the last few years have seen a variety of advancements in lightweight, composite materials. While fiberglass, Kevlar and other composites have been used in aerospace applications for decades, today’s UAV frames are primarily composed of carbon fiber-reinforced polymers (CFRPs). While relatively expensive, a structure made of a CFRP will have just one fifth the mass of a steel structure of similar strength. To offset costs and further lighten loads, many UAV manufacturers are constructing their propellers from Kevlar/epoxy composites, which allow for less inertia, less vibration and greater stability. In turn, lighter weights and greater stability allow more mass to be dedicated to cameras and other add-ons. Speed and distance sensors. Using a combination of sonar, light and magnetic fields, these sensors can detect a drone’s speed and measure the distance between a drone and another object. This data is invaluable in navigating and avoiding collisions. Infrared and thermal sensors. Thermal sensors measure heat variances invisible to the human eye, allowing for night vision, surveillance and detection of overheating equipment. Image sensors. Acting as our eyes in the skies, image sensors convert light into data that computers can use to create digital pictures. Chemical sensors. The molecules inside chemical sensors interact with the molecules present in the environment. When a change in environmental conditions occurs, those interactions trigger transducers within the sensor, which send signals the onboard computer interprets as specific chemical compounds. The combination of sensors and sophisticated flight software has allowed for a great deal of automation, and many drones can self-balance, autopilot and track moving targets. And, even when owners want to pilot their drones themselves, this software helps them avoid mid-air collisions and rough landings. In fact, self-piloted drones are outpacing self-driving car technology, even though the latter has long been in the making. While roads are filled with pedestrians, drivers and unpredictable obstacles, the skies are comparatively clear. Thus, even with limited computing and sensing power, a drone’s computer can make the decisions necessary for a smooth, safe flight. With lightweight materials have come greater speeds. Most consumer models can reach 30 miles per hour, and the Drone Racing League’s RacerX recently set the Guinness World Record at 163.5 mph. Endurance and range have likewise improved, although not in the ways some might assume. As it turns out, larger drones can actually fly longer than their smaller counterparts, due to their propellers’ relatively lower strains on battery life. Overall, these advancements have allowed for a variety of new commercial, industrial and government applications. Amazon, UPS and other major shippers are pioneering drone delivery, for instance, and a few forward-thinking restaurants are even using them to deliver food. Police and security forces are also using drones to analyze hostile situations, and contractors and utility companies are safely scouting pipelines, leaks and other hazards. At Switzer, we strive to contribute to these and other UAV design innovations with durable, high-precision metal parts. We know manufacturing UAV parts is a delicate process, which is why we use chemical etching to create lightweight, tight-tolerance components with prototype-to-production capabilities. 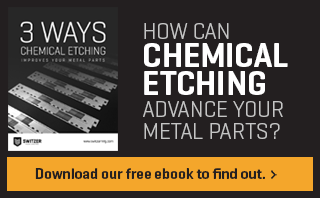 To learn more about the benefits of chemical etching in UAV design, download a free copy of our eBook, 3 Ways Chemical Etching Improves Your Metal Parts.